69 people attended the MRATHS AGM. Mike Burstow chaired the formal AGM with positive increases in activities, talks/school visits (thanks especially to David Whitaker and John Gillham), membership, and funding. He highlighted the submission of our application for Charitable Incorporated Organisation. Unfortunately, several recent deaths were also reported. Hugh Williams chaired the main meeting including Mike’s “thoughts from the chair” with hopes for recording the old site and fundraising/buying/relocating to Malvern a unique home-built replica of a Lancaster bomber cockpit with full original electronics installation. Ben Potter introduced his project to emulate the RSRE Flex research computer system. Hugh shared several intriguing newly acquired photographs. 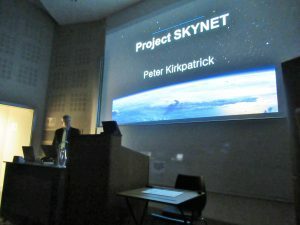 Peter Kirkpatrick talked about Project Skynet including much of the history of UK Space activities. 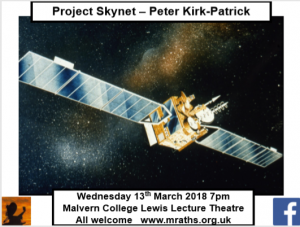 He charted the military, technical and political progress of the SKYNET series of UK MoD communications satellites – from their world leading introduction in the 1960’s; through the dark days of cancellation in the 1970’s and the Phoenix like rise in the 1980’s; through to the Private Finance Initiative in the 21st Century. 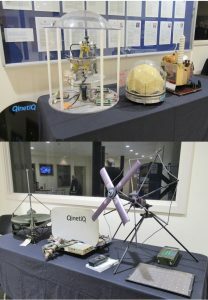 Attendees enjoyed the customary refreshments and opportunities to catch up with people whilst inspecting various models associated with the Skynet programmes.